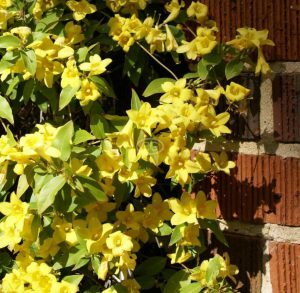 One of the best ways to add visual appeal to a structure is to plant a climbing vine such as Carolina Jessamine. This fast growing, evergreen vine will grow from 10-20 feet tall. Consequently, it is commonly used as a climber on structures like walls, fences, arbors, pergolas, and trellises. Plant it six feet apart, or at each post, and allow a year or two of growth to cover its support. You will be rewarded with a beautiful vine sporting green leaves and bright yellow blooms in early spring. The blooms generally last about three weeks. This vine grows by twisting around its climbing support. Carolina Jessamine doesn’t require extensive trimming, but it is often a good idea to train the plant with a light trim after it blooms in the spring. This will prevent it from growing out of control and also allow you to maintain the shape of the vine and structure as one. A note of caution to those purchasing Carolina Jessamine is that the plant is toxic and should never be ingested, or planted where children might pick the flowers. Also, the sap may cause skin irritation. Carolina Jessamine is an easy plant to grow. It prefers full sun, but tolerates light shade. Furthermore, this plant is not picky about its soil, as long as the soil is well drained and has been improved with organic matter. As a result it will grow in either sandy or clay soils. There is a low water requirement after the plant is established, although occasional watering gives it a brighter appearance.